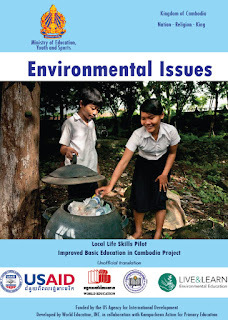 This module seeks to help youth better understand how they can increase their own ‘well-being’ and those of others in their local environments and the national community by acquiring basic principles of literacy about ecology. The word ‘ecology’ is an important one that everyone on our planet should know. It refers not just to the environment, but to the ‘relationship between living things and the surrounding environment.’ What we do in this relationship can have good or bad effects on the environment so it is important that we understand how these interactions work and most importantly, how we can minimize the bad effects and maximize the good effects. When we maximize the good effects, we also increase our own personal well-being. In educational circles, we sometimes call practical knowledge about the relationship between living things and the environment, ‘eco-literacy’ because it is as basic as literacy in ‘language’ or in ‘numbers.’ How many of us have ever seen someone throwing trash out of the window of a moving vehicle or people spraying insecticide from a can nearby someone who is cooking a meal? We can say that people who do these actions are NOT eco-literate because what they do not only hurts the environment but also affects the well-being of those who live in the environment. By training students in the concepts outlined in this manual, it is our hope to prevent such actions from occurring and making our children and youth more eco-literate in the way that they live.